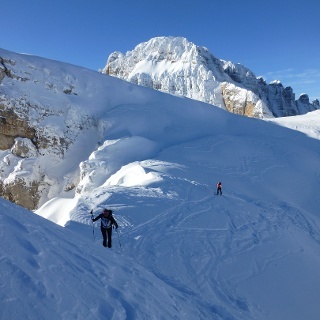 A classic itinerary in the northern Brenta Dolomites which regularly offers some fantastic skiing thanks to the northerly exposure. 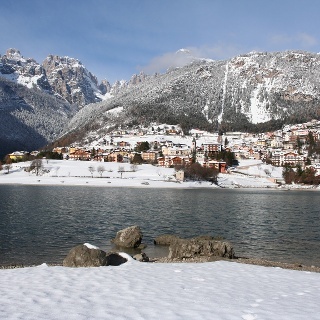 This itinerary doesn’t take you to a true peak but rather a mountain pass named the Bocchetta dei Tre Sassi. The route winds its way along the foot or the north-east face of Cima Vagliana which acts as a watershed between the Gelada valley and the area of Grostè and its ski-lift facilities. The popularity of this area is also due to the regularity of the slopes which are all quite challenging yet never too steep. Despite being a very popular destination, the risk of avalanches in this area must not be underestimated due to the numerous steep gullies and slopes. It’s therefore strongly recommended to avoid excursions after heavy snowfalls and/or significant and sudden rises in temperature. Remember, snowpack stability is subject to sudden and unforeseeable changes and shifts. Always check the local avalanche bulletin (www.meteotrentino.it or any other service that suits your needs) before departure and make sure you gather all possible information concerning current conditions at the Mountain Guides’ office. (http://www.guidealpinecampiglio.it). GPS routes are merely indicative of the more reasonable track but must not be followed blindly without first checking current slope and terrain conditions. GPS tracks are merely indicative of the more standard routes but must not be followed blindly without first checking current slope and terrain conditions. 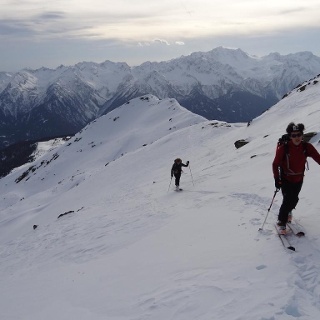 For all ski-mountaineering activities, the proper apparel is strongly recommended. 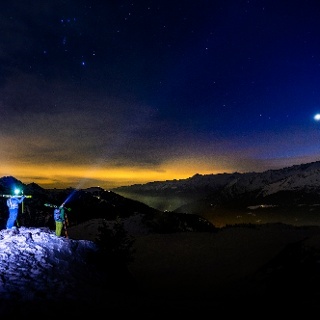 Skiers must bear in mind that temperatures can dip quickly and garments should also be suitable for snowy conditions (such as waterproof Gore-Tex jackets). Furthermore, gloves, cap, sun glasses and sun cream should also form part of every off-piste skier’s basic gear. 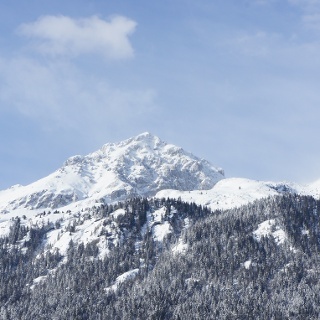 It’s also important to bear in mind that tight fitting or insufficiently waterproof ski boots can cause frostbite. It’s also COMPULSARY to carry with you an avalanche rescue kit consisting of avalanche transceiver, probe and shovel (this is also available for rent). A suitable helmet and other safety equipment are also strongly recommended (avalanche airbags etc.). 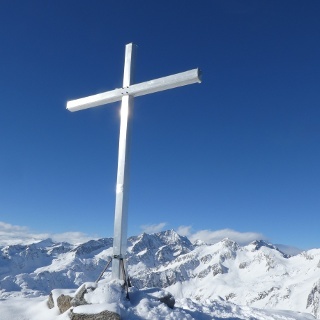 In the case of hard snow cover or ice, ski crampons are recommended. From the cross-country skiing centre in Malghette, you follow a marked route which, after about 30 minutes over gently undulating terrain, leads to the Mondifrà farmhouse. From here you turn right, following the indications for the summer trail, and enter the Gelada valley (Val Gelada). You will soon reach some level terrain which takes you right up to the treeline and the foot of a steep slope. To climb this slope, we recommend you keep to your left (many inversions will be necessary). Once you reach the narrow valley above, you continue in an easterly direction until you reach the Bocchetta dei Tre Sassi. Public transport is available. The no. 231 bus from Trento will takes you to Campo Carlo Magno. 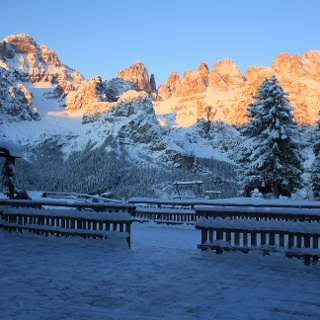 From the town of Madonna di Campiglio, make your way up to the ski-lift facilities in Grostè (you can also reach it by car, and parking is available, if you take the snow-covered road that leads to the Mondifrà farmhouse). After a couple of hundred metres you reach the pass at Campo Carlo Magno and from here, a narrow, downward sloping road on your right takes you as far as the cross-country skiing centre in Malghette. Parking is available at the cross-country skiing Centre (or, alternatively, at the cable car station of Grostè).